I got a tattoo today! 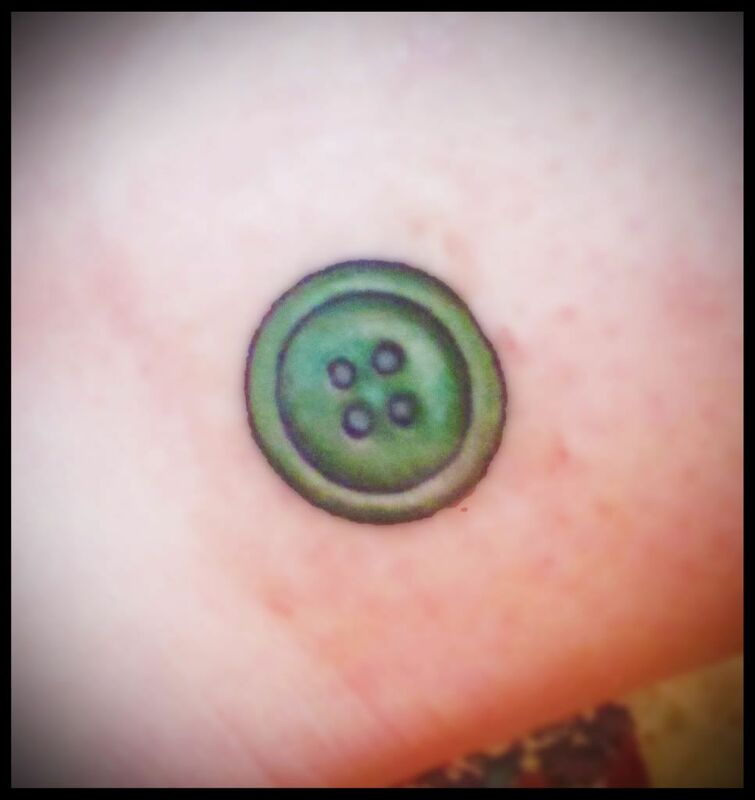 For the past few years, I've really wanted a tattoo of a button, and I figured that with graduation coming up, now was the time to actually do it. It's tiny, just the size of a penny, and on the outside of my left ankle just behind the ankle bone. I absolutely love it. The color is perfect and the shading is beautiful. It was done by Wendi-- when I saw her portfolio I knew I wanted to work with her because her illustrations and tattoos are both so pretty and charming. And she is so sweet, she made me feel totally comfortable even though I'd never so much as set foot in a tattoo studio before my consultation last week. I was worried about getting a tattoo because I am a notorious chicken when it comes to needles-- shots, getting blood drawn, anesthesia, I get completely terrified. But this wasn't bad at all-- the feeling of vibration was much stronger than the pain. And I knew going into it that it would be worth any pain, because not only did I get my button to commemorate graduating from school, but also in remembrance of my dad. I sketched out a button with four holes to represent the four members of my immediate family (my parents and my brother, Zach), and with a raised edge to signify the sort of-- bubble the four of us traveled in when we were together, no matter where we were. The music playing while I was getting the tattoo done was pretty great, too. "The Weight," by The Band, "Like a Rolling Stone," by Bob Dylan, and "Brown-Eyed Girl," by Van Morrison, all played in a row-- three songs that my dad always sang and played on his guitar in our living room and at family gatherings. It was a wonderful final touch on something that already meant a lot to me. And then it was done! I'm so excited that my little green button will be there every time I look at my ankle for the rest of my life. How crazy is that! Now all that's left to do is study French in preparation for tomorrow morning, my last final...ever. Yay! I hope it's as sunny and lovely wherever you're reading this as it is here! Lovely tattoo Julie! And such sweet memories too! Thank you miss Betsey! I can't believe I got up the nerve to actually go through with it, but I'm so glad I did! So glad you like it! I agree, I love hearing the meaning behind a tattoo! p.s. your blog is adorable. leather and gingham and ribbons, oh my! sometimes I do college-kid things. really.